By default the maximum allowed size for uploaded files is set to 1024Kb. This value can be increased (or decreased) in the Editor Parameters section of Editor Profiles for all add-ons that allow uploading, or in the relevant add-on tab in the Plugin Parameters section for each individual add-on. In Editor Profiles click on the name of the Profile to edit, then click on the Editor Parameters tab. Click on the Filesystem tab. 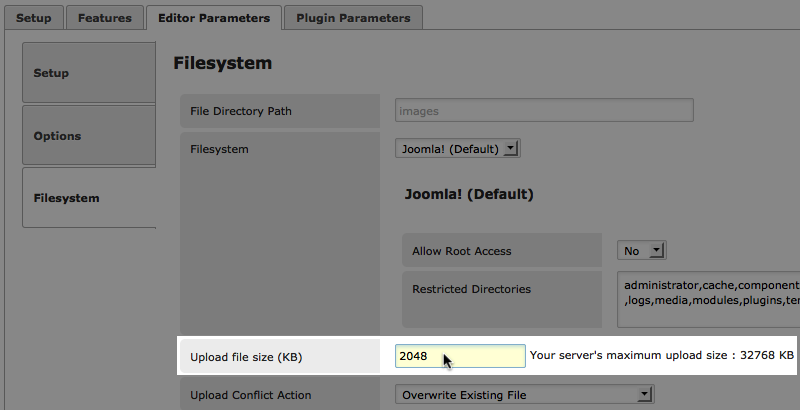 Set the new maximum value in the Upload File Size field, in kilobytes, eg: 2048. The maximum value that your server will allow is displayed next the the text field. The value that you enter cannot exceed this value. The Upload Size can be set for each add-on in the Plugin Parameters tab. In Editor Profiles click on the name of the Profile to edit, then click on the Plugin Parameters tab. Click on the tab for the add-on to set the value for, eg: Image Manager.